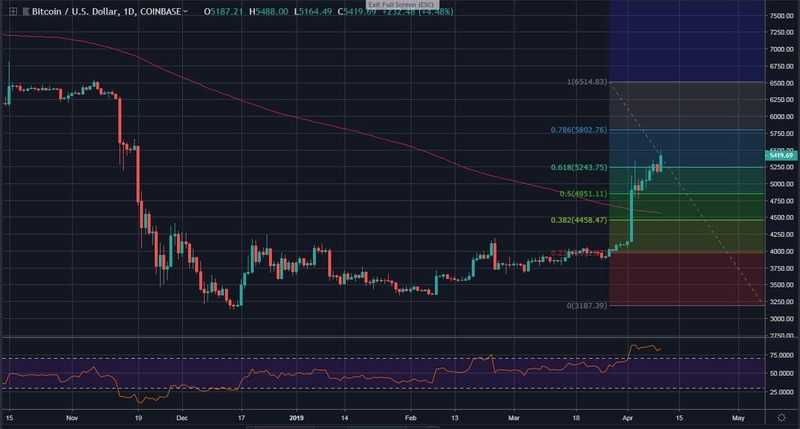 Despite the overbought signal, Bitcoin is still trending high; today, price hits $5400 as a result of increased trading volume with a 3% surge in the last 24-hours of trading. However, the next few days of trading could set the price on a new high or low. 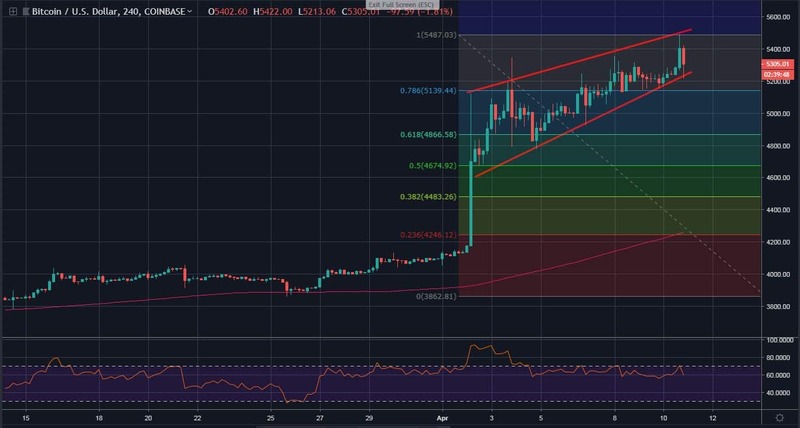 The April 2 surge has clearly push Bitcoin above the red zone of the 0.23 ($4000) Fibonacci Retracement Level. In fact, the breakout was significant over the 200-day moving average, pink line, forming a strong bullish candle. With today’s price increase, the market is above 0.618 ($5236) Fib. level. On the daily RSI, BTC trading has reached an extremely overbought condition; a possible drop may me experience soon. If the RSI crosses down the 70 line, a slight retracement may locate a support at 0.5 ($4845) Fib. level or perhaps 0.382 ($4454) Fib. level; touching the 200-day moving average line. However, the bullish rally may further meet a close resistance at 0.786 ($5800) Fib. level and above. As Bitcoin flags up, the 200-day moving average (pink line) is now acting as a solid defensive line for the bulls. After the last week price surge, BTC has actually followed a bullish wedge formation. The price action is getting tighter towards the angle of trend lines; suggesting a possible break. The 4-hours RSI is now leveled below the 70 line after leaving the overbought territory on April 4. A break above the 1 (5488) Fib. level could propel the bulls to a new high at around $5600 level. However, a significant break down on the wedge might probably correct Bitcoin to 0.236 ($4245) Fib. level; testing the 200-day MA, atop the red zone. The medium-term RSI should then leveled convincingly at the oversold territory.